I walked by the chapel on my way to lunch. “Come in,” my heart whispered. It was still racing a little. I didn’t want to stop. The adrenaline was still flowing after meeting at three different offices on Capitol Hill. At each office, I was with colleagues with the Healthy Families Healthy Planet project. Surrounded by my sisters in Christ, we made our case on behalf of women around the world in front of two Senators and a Congressman. 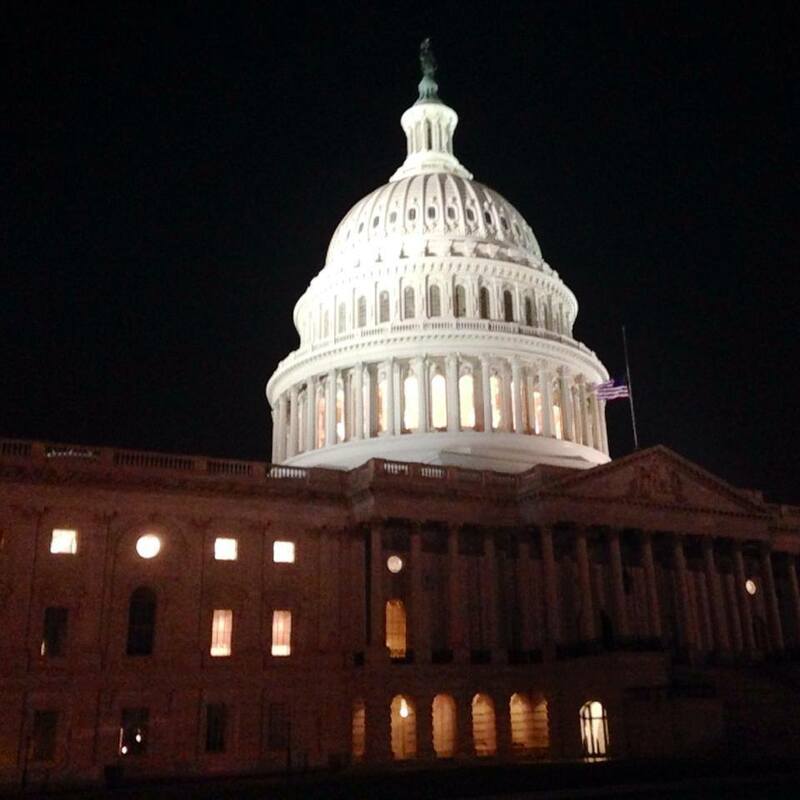 We walked the halls of the Temples of Power, and strode purposefully across the Capitol. We talked about the 222 million women that wish to delay their pregnancies, but cannot gain access to contraception. We spoke for the 270,000 women that die each year from complications to child birth and pregnancy. We spoke for the thousands of mothers that can be saved. We reminded the staffers that funding international maternal health and family planning initiatives could prevent 54 million unintended pregnancies, 26 million abortions, and 7 million miscarriages a year. In just my second trip to Washington as an adult, I gained access to some of the most powerful people in the world. As I walked into the Dirksen Senate Office Building, I felt a sudden surge of desperation. I knew my facts. I knew the stories. Yet I was suddenly faced with the grandeur of it all and doubted. “Who am I?” I thought. Surrounded by so much marble and glass, I could not help but feel the power of my own insignificance. Then something funny happened. Each meeting was a little easier than the last. Each time I looked at my notes less, and looked into my heart more. From left: Rev. 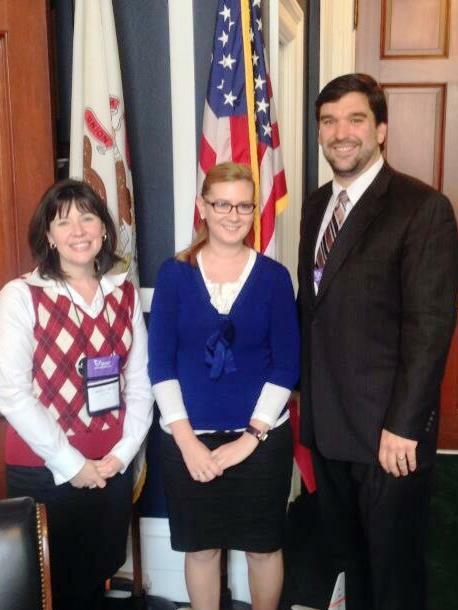 Carrie Carnes (a friend and colleague), Kelli Tripp (a member of Rep. Aaron Schock’s staff), and me. Now back from the three meetings in 90 minutes, I was still in high gear. Still breathing a little heavy. My mind did not want to stop. It wanted to keep going, keep talking, keep engaging. “Come in,” my heart beckoned. I walked into the chapel of the United Methodist Building. I stepped a few rows in, past another taking a similar pause, and sat. I breathed. My heart slowed. My mind opened. I prayed. I prayed of exhaustion. Exhausted by the three days of learning and training. Exhausted by the walking and the waking early. Exhausted by the stories of the suffering women endure around the world. I prayed of mourning. Mourning despair of mothers who have lost children. Mourning my brother in Christ at the training that talked about his own mother losing 10 infant children over the course of her life. I prayed of celebration. Celebrating the strength of so many women. Celebrating the women in my life, and the women I was surrounded by at the training. Celebrating the victories, and the chance to speak the truth to power. I prayed and sunk deeper into my chair as the Spirit washed over me. Then I saw the Bible, once again my heart beckoned, “Come.” I opened the Bible, and read the first verse my eyes focused on, “When Jesus entered the temple, the chief priests and elders of the people came to him as he was teaching. They asked, “What kind of authority do you have for doing these things? Who gave you this authority?” (Matthew 21:23, Common English Bible). Who am I to do these things? I am a father. I am a father who loves two daughters with all of my being. I am a father who dreams of their future and wants to open every pathway to joy in their lives. I am a father who wants to see my daughters grow to be educated, independent, powerful women. I am a father who wants nothing less for all the girls of the world. I am Papa Robb, who will stand up for the girls that no one else will stand for. What kind of authority do you have for doing these things? I claim the authority of the women that suffer needlessly. I claim the authority of the the motherless infants, and the wifeless fathers. I claim the authority of the communities that are stuck in the cycles of poverty that keep them from abundant life. I finished my prayer. I thanked God for this moment. I thanked God for beckoning me to come. And now I will go. I will go with the strength of the women and men I have met on this journey. I will go with the strength of knowledge. I will go with the strength of love. I will go with the strength of Jesus Christ, who came that all may have life, and have it abundantly. I will go with the promise that the work we do is just, the promise of God is steadfast, and the victory is already won. I’ve been given a lot of Father’s Day gifts over the years. I’ve gotten shoes, books, a basketball, shirts, and pictures. When I was in eighth grade, I got a phone for my room. This might sound strange. Not many eighth graders get Father’s Day presents. I remember once telling a friend about the gift my Dad gave me for Father’s Day, and he was confused. My Dad always gave my sister and brother and me gifts for Father’s Day. “Being a Father is the best thing that ever happened to me,” he would explain to us. “And I couldn’t be a Father if it wasn’t for you.” Although that was only technically true of my sister (his first born), I never argued the point. The message was clear, and it was one that I don’t think I truly grasped until I was a father myself. Becoming a father is the best thing that ever happened to me. I am the father of two girls, and I adore them. Their laughter is beautiful music. Their smiles are the greatest of masterpieces. Their imagination is mind-boggling. Their dance is breath-taking. I savor every moment that we are together. They make me want to be a better person. I want to give them everything. On this Father’s Day, I want to give them a gift. This year though, I’m not going to give them a doll or a toy. I’m not going to give them a book or a Blackhawks t-shirt. I’m going to give their gift to someone else, and they are compassionate enough to understand. Instead of giving to them, I am going to give to other daughters, because everytime I look at my daughters, I can’t help but see the future. I dream of my daughters growing up in safety and health. I dream of them getting educated, finding their talents, discovering their gifts. I dream of them making lasting friendships and falling in love. I see tremendous giftedness in both of them, and my most important role as a father is to help them see and develop these gifts for themselves. My dream for them is to fulfill who they were created to be. My dreams for their future are a luxury that I will never take for granted. My dreams for their futures are a luxury that most fathers in the world cannot afford. For most daughters of the world, safety, dignity, education, and health are unattainable dreams. So my gift to my daughters on this Father’s Day is to the daughters of the world. My gift this Father’s Day is a word of encouragement. It is a word of awareness. It is a call to action. Maternal health is not a women’s issue. It is a global concern. For millions of women, giving birth is the most dangerous thing they will ever do. Motherhood should be a gift of life, but far too often it is a death sentence. In many places in the world, women are valued for little more than giving birth. They are treated as a walking uterus, to be valued if they give birth, and thrown away when or if they cannot. Girls are forced into motherhood too soon, when it is biologically possible but anatomically dangerous. They are not allowed to rest and heal between pregnancies. They have little access to contraception. If pregnant, health care is difficult to find, and often impossible to afford. And postpartum care is not even on the RADAR for most. My faith does not let me standby and allow this to happen. Jesus raised the widow’s son because he had compassion for her. He healed the woman that was bleeding for 12 years, returning her to a life fully integrated into the community. He invited the women to learn at his feet, alongside the men. He debated a foreign woman at the well, and exulted her faith. Jesus believed that crazy notion that women are to be valued and treated with dignity and respect. I believe the same, and so I am called by that same Jesus to do something. I am called to give my daughters – and all daughters – a gift. Go to Healthy Families, Healthy Planet. This initiative is funded by the United Nations Foundation, and housed by the United Methodist Church General Board of Church and Society. On this useful website, there are fact sheets, resources for worship, tips for hosting a panel discussion, and instructions on how to host a screening of the film, No Woman, No Cry. Find or host a screening of the incredible film No Woman, No Cry, which tells the story of four women with at-risk pregnancies. This is a touching, emotionally charged movie. It is documentary film-making at its best. Men, stand up and be heard. Too many believe that maternal health is a woman’s issue. In most of the world, men’s voices are the most influential in determining public policy and education. If more men demanded that their daughters were taken care of, it would happen. There are education programs being set up through developing nations teaching men about their role in family planning. Stand up men, for your sisters, your mothers, and your daughters. Do no take the dreams you have for them for granted. Dads, give someone a Father’s Day gift. Give a daughter hope for a future where she is not sold into slavery for her uterus. Give a daughter hope for an education. Give a daughter a dream for her future. Give a daughter the gift of life, and life abundant.